On March 11, 2013, the Federal Motor Carrier Safety Administration (FMCSA) and Senator Charles Schumer of New York announced new efforts to prevent accidents caused by the improper use of consumer-grade navigation devices in trucks and buses. A typical system that a consumer might buy at an electronics or auto parts store may not have software programming to show low bridges, hazmat routes and other information relevant to commercial motor vehicle operators. 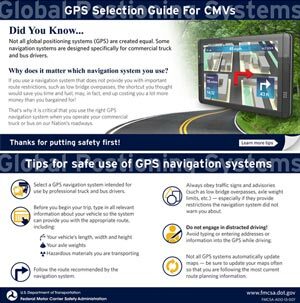 The FMCSA created a visor card specifically for truck and bus drivers on how to choose the right navigation system intended for them. The visor card gives tips for safe use of navigation systems, and can be downloaded free-of-charge at the FMCSA website. The FMCSA will also work with commercial driver training school associations to encourage them to include electronic navigation system selection information their training programs. And the FMCSA will consider electronic navigation system selection as it prepares to move forward with the entry-level driver training rule required by the Moving Ahead for Progress in the 21st Century (MAP-21) reauthorization legislation. Sen. Schumer is pushing for the FMCSA to require GPS training for new operators seeking commercial-driver certification.